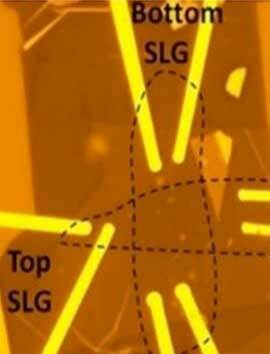 (Nanowerk News) Scientists from the Higher School of Economics, Manchester University, the Ulsan National Institute of Science & Technology and the Korea Institute of Science and Technology have developed a novel technology, which combines the fabrication procedures of planar and vertical heterostructures in order to assemble graphene-based single-electron transistors of excellent quality. This technology could considerably expand the scope of research on two-dimensional materials by introducing a broader platform for the investigation of various devices and physical phenomena. The manuscript is published as an article in the Nature Communications ("Planar and van der Waals heterostructures for vertical tunnelling single electron transistors"). In the study, it was demonstrated that high-quality graphene quantum dots (GQDs), regardless of whether they were ordered or randomly distributed, could be successfully synthesised in a matrix of monolayer hexagonal boron nitride (hBN). Here, the growth of GQDs within the layer of hBN was shown to be catalytically supported by the platinum (Pt) nanoparticles distributed in-between the hBN and supporting oxidised silicon (SiO2) wafer, when the whole structure was treated by the heat in the methane gas (CH4). It was also shown, that due to the same lattice structure (hexagonal) and small lattice mismatch (~1.5%) of graphene and hBN, graphene islands grow in the hBN with passivated edge states, thereby giving rise to the formation of defectless quantum dots embedded in the hBN monolayer. 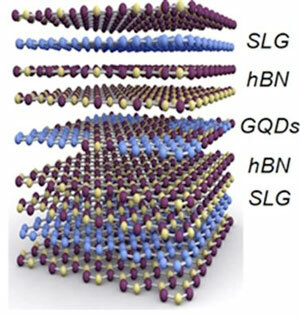 Such planar heterostructures incorporated by means of standard dry-transfer as mid-layers into the regular structure of vertical tunnelling transistors (Si/SiO2/hBN/Gr/hBN/GQDs/hBN/Gr/hBN; here Gr refers to monolayer graphene and GQDs refers to the layer of hBN with the embedded graphene quantum dots) were studied through tunnel spectroscopy at low temperatures (3He, 250mK). 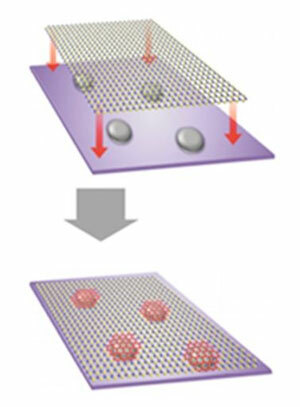 The study demonstrated where the manifestation of well-established phenomena of the Coulomb blockade for each graphene quantum dot as a separate single electron transmission channel occurs.